Retail Marketing no longer tolerates weak marketing. Category Management is a science and those without the scientific knowledge of Category Management are quickly exposed when Category Reviews are presented. A Category Review is an opportunity to star, or to strike out, but the rewards are plentiful for those that undertake diligent analysis in their Category. Our leading-edge-strategy consultants are experts in this field... ask for help... Category Management is not something you just 'work out as you go". Evolving out of grocery retailing, Category Management is a retail management approach of dividing a business into distinct groups by product categories and managing the retail dynamics productively to optimise retail efficiency and maximise customer satisfaction . What is a Category Review? The process a Category Manager uses to objectively assess each participant in his/her category to determine the validity of the win/win relationship shared between trade partners. The future of brands can be decided in the period of a week or less, so it is crucial to employ every piece of knowledge you have from the market research and analysis, to present the perfect permutation of products for the Category. Using knowledge you have gained from market research, performance analysis, customer experience feedback, and trade partner intelligence, it is up to the Key Account Manager, Marketing Consultant or Food Broker to construct a Category Review Assessment that assist the Category Manager to draw up the best possible Category Plan. A formal Category Review Presentation should include salient market research, analysis, range review and business development plan. It is vital to remember that retailers do "not have rubber walls" and the limitations on their space is exceed by the demands of aspiring marketers to win shelf presence. Define the Win/Win Business Opportunity - SWOT & Critical assessment of any contingencies, Consider Macro/micro issues, PESTLE, Industry, Competitive and market forces. Refine and distribute action program with monitoring feedback & control mechanisms and checklist. Optimise your Category Management opportunity with insightful Market Segmentation, P.E.E.R.S.M.A.R.T. Marketing Planning and a collaborative understanding of Marketing. Ask us to undertake a comprehensive Category Review, or if you're confident, simply use the Category Review Template we've compiled below. Click here to download our latest Category Management training workshop that provides details of the content. Category Management Training Workshop Outline. ... or contact us to scope put your own, in-house, training workshop! 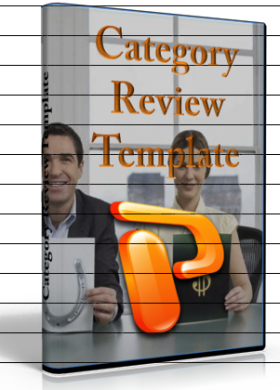 To deliver a comprehensive Category Review Presentation, download this helpful Category Review Template in PowerPoint format. Not Confident about New Line Submissions, Category Reviews or Category Management? If you have read this far, you may want to talk with someone who can help... so why wait? Get started now... Just fill out this form and consultant will get back to you ASAP. Remember, "Procrastination is the thief of time" and the sooner you know watch direction you are going in, the sooner you'll achieve your goals!